Facing Kyle Kendrick isn’t exactly the same thing as using PEDs. Kendrick certainly has a habit of enhancing the performances of opposition batters, but the players who hit against Kyle Kendrick aren’t technically cheating. They’re not doing anything insidious, not violating some sort of rule, written or unwritten. They’ve simply had their names penciled into the lineup on the same day that Kendrick has been asked to start for his club. No need for an asterisk. A mental note, perhaps. But bad pitching is a part of the game. In some form, there will always be a Kyle Kendrick. Seth Smith happened to be in the lineup when Kendrick started against Baltimore on Thursday. Perhaps it’s not accurate to say that he “happened” to be in the lineup. He’s the team’s usual leadoff man against right-handed pitchers, and Kendrick does indeed throw with his right hand. So there Smith was, doing the job that the Orioles have asked him to do. He’s not a typical leadoff man, in that he’s not a speedster. But he gets on base, and that’s what matters in the quest to set up Adam Jones and Manny Machado. Suffice to say, Smith did his job on Thursday night. Smith went 4-for-4 with a walk and scored two runs as Baltimore walloped Boston 8-3. Kendrick went just four innings. He allowed six runs, including a moonshot by Machado. He was, in essence, Kyle Kendrick. But that simple fact, that very essential and intrinsic fact of baseball, helped Smith morph into a fearsome, exasperating monster of a player for the duration of the game. Smith entered the game hitting .222. He exited hitting .286. There was no big, ringing hit from Smith. The closest thing to it was an opposite-field double that brought two runs home. But it was how his hits happened that made this night special. Because the things did on Thursday made him appear awfully similar to Mike Trout, who just so happens to be the best player in the game. The Ring of Power could only be destroyed by returning it to whence it came, in the fiery Cracks of Doom of the great volcano Orodruin in the land of Mordor. Frodo Baggins and Samwise Gamgee had to travel all across Middle-Earth to accomplish this, traveling a great distance and encountering many perilous places and foes. Yet as is often the case, traveling a great distance resulted in accomplishing a great thing. Frodo and Sam rid the world of the Dark Lord Sauron. Luke Skywalker traveled to what was left of Alderaan and became a galactic hero. I am a massive dweeb. Marcell Ozuna sent a baseball on a grand and glorious journey last night. He did not destroy it to eliminate a great evil, depending on how you feel about the Rays, but he did launch the ball into a far-flung flight. He sent a baseball into a part of Tropicana Field that was hitherto unexplored, and exploration of decrepit ruins like the Trop often yields important archeological information. The ball was like a sports version of the Cassini probe, a lonely adventurer into parts unknown. Consider, for a moment, Kyle Schwarber. If you saw him in street clothes and were told that he’s a professional athlete, you would assume that he’s a football player. A linebacker, perhaps. Some sort of bruiser with the job of clobbering other players. Schwarber’s job is not to clobber other players, however, but rather to clobber baseballs. He’s quite good at that. This year, however, has been something of a struggle for the goateed one. Last night’s 0-for-4 showing sent Schwarber under the Mendoza line and dropped his batting line to an unsightly 79 wRC+. It’s early yet, and Schwarber has just 115 plate appearances to his name so far this season, but this is decidedly not what the Cubs want from their leadoff hitter and one of their biggest (literally and figuratively) sluggers. Joe Maddon’s usage of Schwarber in the leadoff spot is predicated upon Schwarber’s theoretical ability to get on base. To be fair, he’s done an admirable job in that. Rocking a .322 OBP with a .196 average isn’t easy at all. Getting some more hits will make that OBP go up even more, though, and Schwarber (or any hitter, for that matter) is at his best when he’s crushing the ball into the next time zone. Schwarber hasn’t had a real chance for prolonged big-league time just yet. He played in 69 games when he first came up, and then lost nearly all of last season to his devastating knee injury. Despite his talents and his exploits in the postseason, we don’t yet have an idea of what a full season’s worth of Schwarber really looks like. We’ve got 393 regular-season plate appearances with which to work, though. So let’s poke around a bit. A variety of maladies were already plaguing the Mets before they met with the media on Thursday morning. Things would soon get worse, however. Reporters soon learned, for example, that in addition to the six Mets currently on the disabled list, Noah Syndergaard would not be making his start due to a bicep issue. Matt Harvey would be getting the ball that day instead. Before the day was out, Yoenis Cespedes would leave the game after further injuring a balky hamstring, and Harvey would fail to make it out of the fifth inning. They’ve now lost six straight games, and added further insults and injuries to an already large pile of both. 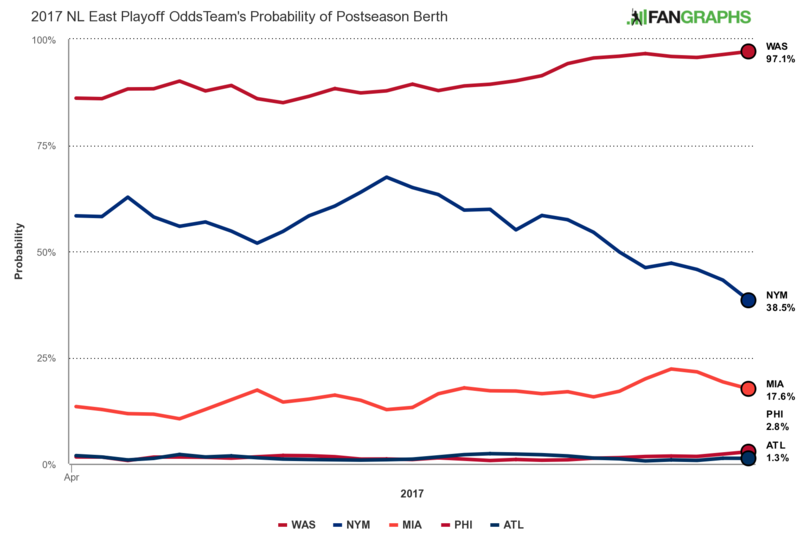 Less than a month into the season, their playoff odds are starting to get ugly. The Mets likely can’t be blamed for every single issue currently plaguing them. They can be blamed, however, for some of them. Too many of them, perhaps. Prior to the start of the season, a new collective bargaining agreement between the league and the players’ union was put into place. Among the new provisions within the document was a new 10-day disabled list, shortened from 15 days. It was created with the idea that teams could have more flexibility in giving time off to banged-up players. Clubs, in turn, would have more freedom to call up replacements and to avoin playing with an understaffed roster. Some teams, including the Mets, had gotten into a habit of playing a man or two down while players nursed injuries deemed too minor to merit a full 15 days on the DL. Now, teams can theoretically get players back five days earlier, and play with 25 men. Everybody wins, no? The Mets have failed to fully embrace the possibilities afforded by a 10-day DL. Cespedes originally injured his hamstring on the 20th. He didn’t play again until Wednesday, partially due to an off day and a rainout, although he did come out on deck for a possible pinch-hitting appearance on Sunday before the Mets lost. The Mets and their training staff had decided that Cespedes didn’t need a full DL stint, just a few days off, with potentially a plate appearance off the bench mixed in. Cespedes came up slightly lame when he hurt himself on the 20th. He needed help getting off the field yesterday. It’s not an ideal situation for a man who’s still dealing with the vestiges of a quad injury that sidelined him for part of the 2016 campaign and never really released him from its grip down the stretch. Of course, Cespedes isn’t the only Met who has been carried along for the ride in such a fashion. Both Asdrubal Cabrera and Travis d’Arnaud were in similar states of limbo in the past week. The clubs has done this quite a bit over the last few seasons. It now appears to have cost Cespedes at least a few weeks of action. Seemingly ever since humans gained sentience, we’ve been obsessed with the concept of flight. How powerful birds must have seemed to ancient man, able to free themselves from the constraints of the ground. Joyous was the starling, dancing and warbling through the air. Terrifying was the hawk, diving for a kill. To fly is to move in ways unimaginable for those trapped on the surface. We stared at the sky, the last frontier to be conquered, and dreamed. We told stories of magical heroes and gods who could fly. We sought any way possible to experience it, from the Dark Ages to Da Vinci and on. By the time we came up with hot-air balloons and gliders and airplanes and helicopters so that we could join the birds in the sky, perhaps we lost a little bit of that wonder. Generations have now grown up with intercontinental flight as a simple fact of life. We still dream of joining the birds in the skies, of flying like Superman. But we no longer wonder if it’s possible. We know that we can fly with mechanical aid. But we’ll never truly join the birds. At least not for more than a few seconds. It’s a small stroke of genius that the gods put Chris Coghlan on a team named after a bird. And indeed, last night’s Blue Jays came in St. Louis against the Cardinals, who are also named for birds. Teams named for birds play each other all the time, of course. The Jays play in the same division as the Orioles. Almost none of those games, if none at all, have featured a moment like this. We can’t earnestly call what Coghlan accomplishes here flight. If anything, it’s falling with style. It’s a leap and a near-perfect handspring. It’s something out of a gymnastics exhibition, except Coghlan is wearing cleats and a helmet instead of a unitard. It’s the closest anyone’s come to real, honest-to-goodness flight on a baseball field since Ben Revere achieved liftoff in 2013. Coghlan didn’t plan on springing over the head of Yadier Molina. Like the most satisfying superhero origin stories, he didn’t know he had the power inside of him. He jumped because instinct told him to, because years upon years of baseball conditioning told him to score that run. Humans are capable of great physical feats when fueled by adrenaline and instinct. They can lift cars, run faster than they ever have before. For a few precious seconds, they can fly. If they’re lucky, they can even stick the landing, like Coghlan did. It’s not a shock that Madison Bumgarner has never been on the disabled list before now. He’s a big horse of a man, made purely of muscle and tree sap. The only thing that’s prevented him from being sidelined is Bruce Bochy not letting him throw 400 innings in a year and, apparently, that he’s been steady on a dirt bike until now. Everyone has bad days at work. You’ve had them. If you read my work, you sure as heck know I’ve had them. Even Mike Trout’s theoretically had one or two. Not everyone can be on top of his or her game at every second of every minute on the clock. It’s just a simple fact of life. 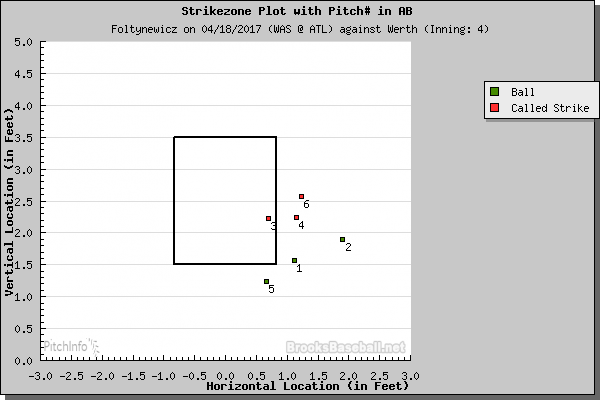 CB Bucknor seems to have these nights more often than most. Any cursory poll asking for the names of the worst umpires in the big leagues will yield Bucknor’s name as one of the most popular answers. Less cursory polls have produced a similar result. He has long been at the center of some of baseball’s more frustrating officiating experiences, whether it be with his work behind the plate or on the bases. It was the former that drew the ire of just about everyone in Cobb County last night, especially that of Jayson Werth. He struck out. BrooksBaseball and PitchInfo think the third pitch was a strike, and video from last night shows that it was borderline, but not an egregious call. We never really know what to expect when a player comes to Major League Baseball from a foreign league. The rules of the game are mostly identical over there, of course, but the competition level is different. It’s a completely different set of hitters and pitchers in a completely different set of parks. Even for truly exceptional talents, there’s no real telling how a player’s skills will translate precisely from league to league. The calculus gets even more interesting when it involves a player who started here, faltered, went elsewhere, and thrived. April is a time of guessing and extrapolating and of the occasional hot take. We like to draw conclusions when we perhaps shouldn’t. That’s half of the fun of April baseball. And Eric Thames is one of the cool new things happening in baseball right now. Because, as we’ve been reminded, this man can hit some dingers. He just finished hitting five in one series against the Reds. Now, the Reds play in a tiny little stadium, and they don’t have the best pitching in the world. If Ryan Braun had been the one to do this, it would be a cool little footnote, because we expect guys like Braun to stomp on subpar pitching in tiny ballparks. If Jett Bandy had done this, I’d assure you that Jett Bandy is, in fact, a real person, and that this is an aberration. Thames is a different matter. This is Eric Thames, who left American organized ball and rather quickly became a league-wide sensation in Korea. This is Eric Thames, who got big, grew a mighty beard, donned what looks like cybernetic robot armor on his right arm, and promptly started hitting massive bombs. Thames took on a nearly mythic quality for a few years, watched from afar by those who still remembered his name and who pay attention to foreign leagues. We got our wish, and he’s back. We get to see if a man who couldn’t cut it in his first try can succeed after dominating a foreign circuit. So far, he’s doing quite well. It’s probably too early to declare the Thames experiment a success. It’s April 17th, after all. The Brewers have played 13 games, and Thames now has just 44 plate appearances under his belt. He’s already created 1 WAR of value, and that translates to about $8 million of value, but he could just as easily create negative value in the coming weeks as a scouting report starts to form. Baseball is, of course, also not played in terms of cost-effectiveness and surplus value. Thames wants to succeed for Thames, not to make David Stearns look smart. He’s still got a long road to go. In short, we can’t tell anything for certain from this collection of data. There’s simply not enough here. But consider this, because it is the height of April fun: the two highest single-season ISO marks of all time belong, rather predictably, to Barry Bonds and Babe Ruth. Bonds put up a staggering .536 in 2001; Ruth, a much-lower-but-still-quite-impressive .473 in 1920. Eric Thames currently has a .553 ISO. Cleveland’s got a good pitching staff. It’s part of what got them to the World Series last year, and it’s what they’re hoping to ride to another playoff berth. They’re blessed with excellent arms like Corey Kluber, Andrew Miller, Carlos Carrasco, Cody Allen and Danny Salazar. Michael Martinez is not, by trade, a pitcher. He’s technically a hitter, but his career 33 wRC+ doesn’t exactly support that claim very well. The best way to describe Martinez from a job description standpoint would be to say that he’s a fielder, a utilityman, perhaps. He’s a survivor, who’s managed to stick on big league rosters in some capacity since 2011 despite being a nearly nonexistent asset at the plate. Martinez is the ultimate 25th man, who will be forever emblazoned in the visuals of history by making the out that won the Cubs their first World Series in more than a century. One of the jobs of a 25th man is to do anything that is required of him. And that means that in certain situations he’s a pitcher, too. Cleveland was losing 10-4 to Chicago in the ninth inning last night, following a disastrous outing from Josh Tomlin. Rather than burn another reliever, Terry Francona turned to Martinez, his trusty 25th man. For the first time in his big league career, he took the mound. Martinez had somehow avoided the task until now, despite being the last man on the bench for some bad Phillies teams. The only other time he’d pitched was all the way back in A-ball in 2007, when he’d gotten into two games and totaled 1.2 innings of work. He did not allow a hit in either outing, because A-ball is a magical place. The big leagues are not A-ball. The big leagues are full of hitters who sneeze at A-ball pitching, and one or two who hit like Michael Martinez. Everyone on the White Sox is technically a big league hitter. Yet we can all agree that there are more difficult assignments than innings composed of Carlos Sanchez, Omar Narvaez, Leury Garcia, and Tim Anderson.